“The Blob”: Frog Spawn From Outer Space or Jersey Devil Chow? It’s 1958 and you’re standing in line for the latest horror movie to hit the big screen, The Blob starring Steven McQueen. What you and your fellow movie-goers may be unaware of is that the terror-filled film you are about to watch was inspired by real events! Two veteran police officers, John Collins and Joe Keenan are out on a routine patrol when they see something unusual in the night sky, a large, glowing, purplish-colored object drifting down to earth. They immediately head towards it in their patrol car and determine the object is going to land in a large, open field about half a block from Vare Avenue and 26th Street. The object reportedly glittered in their headlights as they got closer. After parking, the officers grabbed their flashlights and entered the field, finding a ‘purple jelly’. The substance, approximately six feet in diameter and nearly a foot thick at the center, quivered and appeared to pulse. As if that were not strange enough, when they turned off their flashlights, the purple glob glowed brightly enough to illuminated part of the field. The officers said they got the distinct impression that whatever it was, this thing was alive and they needed backup! Two more officers, James Cooper and Sergeant Joe Cook, arrived minutes later. After what must have been one of the most bizarre conversations the four men would ever have in their lives, it was decided to try and lift it and get some sort of sample. They circled the mass. Collins was the first to work up the courage to actually touch it. Upon doing so, the blob immediately began to dissolve. It left some traces on his hands, but those too quickly vanished, leaving nothing more behind than an ‘odorless scum’. In less than half an hour the entire object had dissolved. Seven years later, this particular purple glob would go on to inspire the movie 1958 you is standing in line to see. Star Jelly. Not Purple. Not Glowing. However, this was neither the first, nor last, reported incoming glob-blob sighting to fall to earth. Reports date back to as far as the 14th century and as recently as 2001 in both England and Massachusetts. The most common explanation is a substance called ‘Star-Jelly’, believed to be material carried into the Earth’s atmosphere via meteors. It’s not alive, it’s just space goo, the skeptics claim. 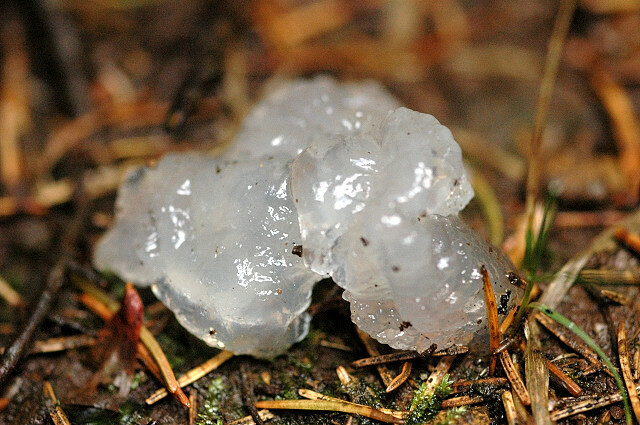 Another explanation reports that these masses of quivering gel are nothing more than puddles of dead frog eggs. It’s claimed by experts that the eggs could have been dropped by a bird who caught a female frog primed to deposit her eggs. As the bird’s sharp talons disembowel its grab and go meal on the wing, the eggs are unceremoniously spilled and fall back to the ground. Frog Spawn. Still not purple. Still not glowing. This is all well and good and may explain some of this mystery, but neither of these hypotheses explains the purple glow, the pulsing, or the massive size of the 1950 Philadelphia sighting. That had to have been one hell of a big frog, not to mention the size of the bird it must have taken to catch and carry that unfortunate amphibian away. Remember, it was said to have been six feet across and a foot thick in the middle. Maybe the Jersey Devil was involved in some way. He/She/It is reported to be nocturnal, big, and strong and the Jersey Pine Barrens are less than an hour’s drive from Philadelphia, and a lot closer as the Jersey Devil flies. 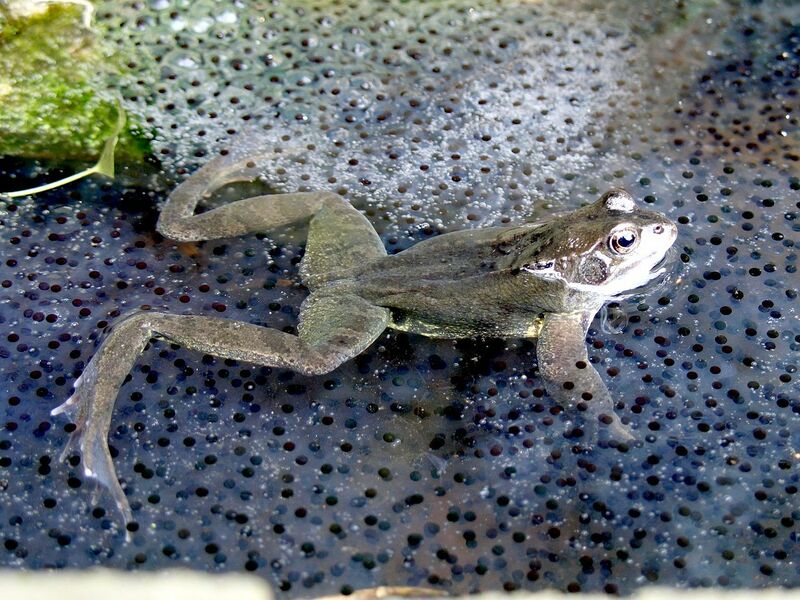 Plus, since when do frog eggs dissolve when you touch them? I’m a small town girl who’s had more than my fair share of frog egg encounters and, trust me, they don’t just dissolve as described by the four police officers. So, what was it? Due to lack of any physical evidence whatsoever, we’ll probably never know. Either way, the real events from 1950 certainly inspired one of the greatest B-movies of all time and it’s one I would strongly recommend you see if you haven’t already. 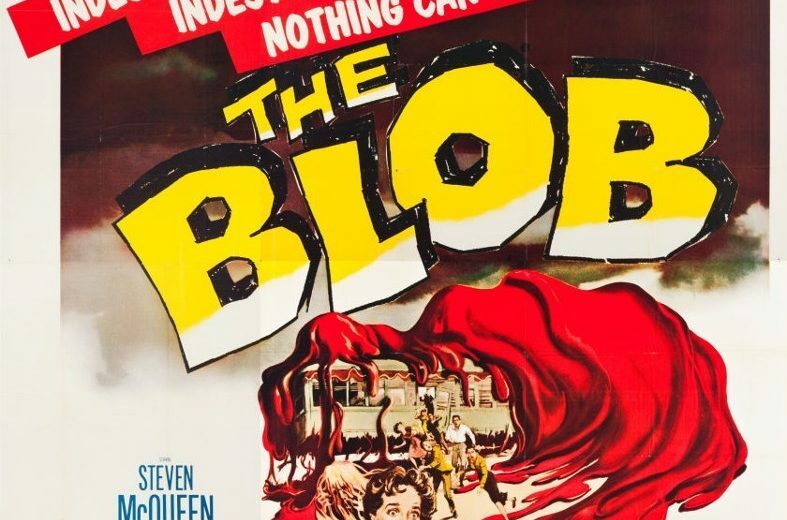 For more in-depth information and speculation on these mysterious globs, check out Rob Morphy’s 2011 article “Beware The Blob” at Mysterious Universe. According to my Blog Calendar, this is the weekend I should be posting some sort of review, be it a book or a movie. This time around, being as I’ve been so intent on finishing up the first draft of my next Barnesville Chronicle novel this past month, reading anything too long and deep just hasn’t happened. I haven’t watched any movies worth reviewing. Unless stating that The Adventures of Baron Munchausen isn’t my cup of tea, counts as a review. Technically it’s not a Monty Python movie, but Terry Gilliam and Eric Idle were both involved in its creation, as was Robin Williams! You’d think with that sort of line-up, it’d be something more amazing than I found it to be. It just left me confused and wondering what sort of drug Gilliam was on when he came up with all this. About halfway through, I decided I had more interesting things to do, like sort through my dresser for old clothes worthy of being donated somewhere. Moving along, I did do a bit of reading. 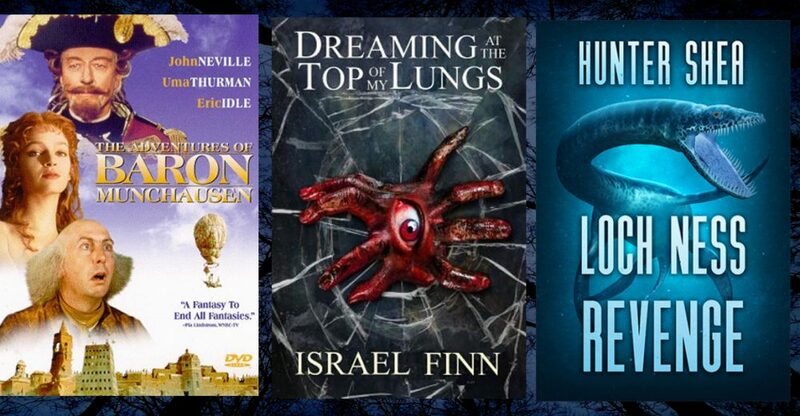 Dreaming At The Top Of My Lungs by Israel Finn is a collection of short stories of the horror variety. There’s always a touch of envy in me for people who can pull off a successful short story. In a mere 112 pages, Israel managed to keep me fully engaged and amused for about ten days. As with any collection or anthology, by even the most famous of writers, there are going to be stories that readers will enjoy more than others. I have to be honest and say that there were a few in this collection I didn’t quite ‘get’ or felt like they were lacking somehow. However, the majority of them I thoroughly enjoyed and enough so that I’d easily consider picking up more work from this up-and-coming author. My biggest complaint about this book is that it was far, far too short. Loch Ness Revenge by Hunter Shea was another quick read for me, coming in at 141 pages. Hunter is a pro at sucking the reader in and half-chewing them before spitting them back out covered in blood, goo, and whatever other sorts of partially digested stomach contents may have been in there at the time. And I mean that in nicest way possible. If you enjoy monster killing mayhem and madness, you really should check out not just Loch Ness Revenge, but all his other cryptid tales. I have the same complaint with this as I did Israel’s book – too short. I wanted more details about the characters and their lives, but with these shorter books, Hunter’s skills and talents as a story teller aren’t being put to their full potential. I really do prefer his novel length works. For me, a story is only as good as how well I get to know the players. Short and sweet this time around, folks. I have some thicker works reaching the top of my TBR pile now and with first draft of my latest Barnesville Chronicle, The Witch’s Backbone finally done, maybe I’ll find some breathing room to do more reading. It’s hard to believe it’s the middle of May already. Spring has been desperately trying to spring here in the Northeast. Here’s hoping our recent bought of warm and sunny weather is going to stick this time! April proved to bring us a plethora of rain. May has certainly blessed us with flowers. One of my four lilac bushes is literally drooping to the ground under the weight of its own flowers. 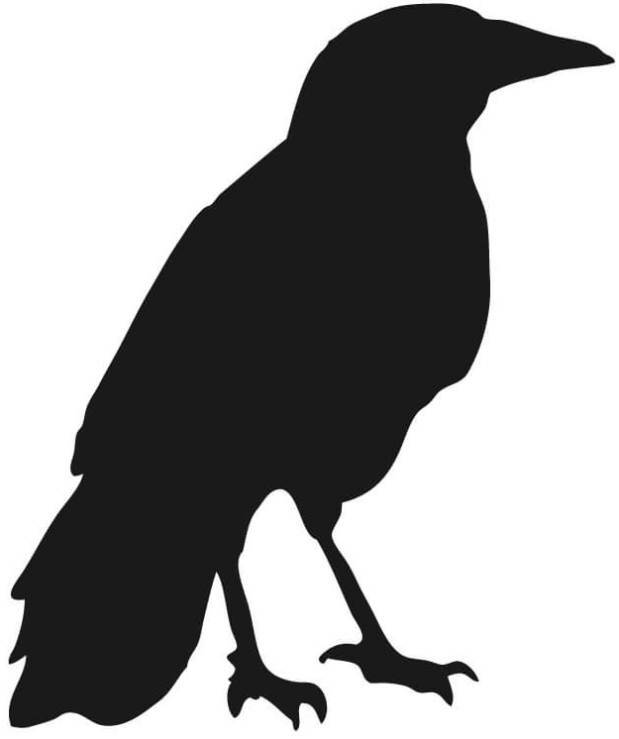 The small murder of crows I’ve been trying to lure in with peanuts and cat kibble are slowly making a comeback by perching in the trees outback and cawing at me. Our back yard is mostly set up and ready to go for a summer’s worth of friends, family, evening fires, fair weather, and food. 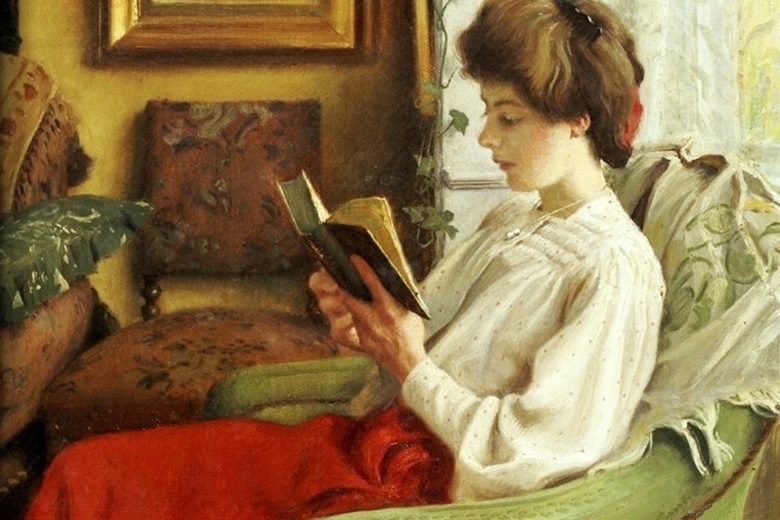 In between all of that, along with writing and submitting a couple novels and a bit of dark poetry to some publishers – one of which has already been accepted – I’ve managed to get in some reading time. In last month’s Book Bag, I’d just started Ann Radcliffe: The Great Enchantress by Robert Miles. I’m happy to report, I’ve emerged victorious from this adventure into some serious literary analysis, yes, Sigmund Freud even showed up! It reminded me way too much of all those English classes where the instructor insists that the color of the chairs is symbolic of the four Cardinal directions as specified in some mystic’s dream book from the early 15th century. Maybe it was, maybe it wasn’t. I don’t use a lot of symbolism when I write and the one time I tried to be clever that way, I got so bogged down in trying to remember what represented what that I completely lost track of where I wanted to go with the plot. I tend to believe the chair was blue, red, yellow, or green because the writer liked that particular color and thought it would be nice, but maybe that’s just me. That aside, I learned the difference between ‘horror’ and ‘terror’ as it was defined back in the late 1700s and that Romances weren’t considered Novels. An interesting and educational read despite the academic dryness. While slogging my way through that, I managed to get in some good old short stories from Israel Finn’s collection, Dreaming At The Top Of My Lungs. I’ve been eyeballing this book for a good long while and finally decided it was time to give it a read. As with any collection or anthology, you’re going to find some you really enjoy, some that leave you confused, or some that just don’t hit the spot. Happily, most of Finn’s stories were very enjoyable and better still, memorable! My biggest complaint on this one is that it was way, way too short! I’m hoping to add more of Israel’s work to the TBR pile in the future. I recently dove back into the dark and murky depths of another Hunter Shea cryptid book. This time it’s poor old Nessie that he’s picking on. Hot on Shea’s aquatic tail (see what I did there?) is a Lyle Blackburn book that takes us beyond the realm of Boggy Creek to look at other cryptids of the ‘Squatchier kind found deep in the American South, but we’ll save any further details on those for next month. Based on Lyle Blackburn’s 2012 book, The Beast of Boggy Creek, and produced by Small Town Monster Films, this hour-long documentary begins where The Legend of Boggy Creek ended back in 1972. Like so many of my generation, I saw the The Legend of Boggy Creek when I was an impressionable youngster. It struck terror into the hearts of many. I’ve watched other documentaries on Bigfoot, as per my reviews HERE, and most were more than a little hokey. Not so with Boggy Creek Monster. Lyle has a serious curiosity about this legend and listens with genuine interest to the current residents of Fouke, Arkansas where it started. You’ll learn back story that wasn’t touched on in the original movie and you’ll be brought up to date with sightings that still go on to this day. Previously unreleased audio recordings of Smokey Crabtree make their debut as well as interviews with current relatives of the Crabtrees and other families that were present during the initial filming in the early 1970s. This documentary really makes me want return to Fouke with a little more time and a little more exploration. It’s a must-see for anyone who grew up both loving and fearing the ‘monster’ of Boggy Creek. My only complaint … it wasn’t long enough. 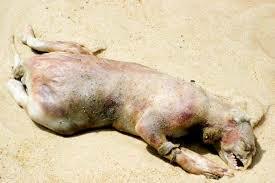 So, you think you know the Montauk Monster, do you? You may want to think again. Horror author and Monster Man, Hunter Shea has a theory. Let’s hope he’s wrong. In July 2008 a mysterious creature was found dead on a beach in Montauk, NY. Guesses of what the creature was ranged from a raccoon, a shell-less turtle, a small sheep, and a dog. But the most interesting guess was it was an experiment from the Plum Island Animal Disease Center nearby. Had this been a singular, isolated case perhaps less would have been thought of it. However, another odd-looking unidentified creature was found in March of 2011 in Northville, NY. In July 2012, a similar one appeared beneath the Brooklyn Bridge in the East River in New York City. Finally in December 2014, a forth body washed up on a beach in Santa Barbara, California. Enter Hunter Shea, creator of “Swamp Monster Massacre”, “The Jersey Devil”, and “Loch Ness Revenge”, horror novels where the author takes what we think we know about these legendary cryptids and twists them into blood-thirsty terrors, hell bent on destruction. 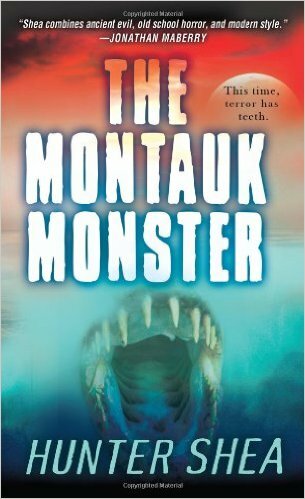 “The Montauk Monster” is no exception. Where did these things come from, because believe you me, there’s more than one. Are they lab experiments or freaks of nature? Most importantly, how can they be stopped? Once you take Shea’s hand there’s no letting go. He takes off on a dead run from start to finish as one attack after another and the efforts to stop them are presented to us in all their gory Technicolor glory. This is my fifth Hunter Shea novel and it’s become my favorite. With the others he uses a cryptid with known attributes. We know what Bigfoot looks like and, in general, their preferred habitat. The legend of the Jersey Devil has been around for hundreds of years, as have stories of Scotland’s Loch Ness Monster. We know them and in many cases, have grown to love them. Not so with the Montauk Monster. He’s new. He’s different. He’s anybody’s guess. I really enjoyed what Shea did with this one because it was so much his own creation, based less on what we know and more on our wildest, weirdest, and most terrifying speculations. Five out of Five Ravens. The 1970s was a, well, BIG decade for Bigfoot. It seemed like he was everywhere. On Saturday mornings we had ‘Bigfoot and Wild Boy”. Steve Austin took on a robotic version of the creature in The Six-Million Dollar Man, and of course, Leonard Nimoy went ‘In Search Of … Bigfoot.” There was even a Bigfoot board game where you got to track the elusive beast. But where Sasquatch really made his biggest imprint was at the movies! When I learned about last month’s released of Boggy Creek Monster: The Truth Behind The Legend the spiral into the depth of my childhood and my love and fascination with all things Bigfoot struck anew. I selected five films from those fabulous 70’s to either watch for the first time or watch yet again to remind myself how good or bad they really were. And so without further delay, let’s begin our Bigfoot Binge! Bigfoot (1970) – Directed by Robert Slatzer. Starring John Carradine and Joi Lanning. Two buxom and scantily clad babes are kidnapped by a small band of Bigfoots (or is that Bigfeet? )… Anyway … One of the ladies is part of a motorcycle ‘gang’ and her boyfriend isn’t too happy about his girl being taken hostage. Having been separated from his biker friends because these two just HAD to stop and have a romantic interlude down by the creek, and unable to catch up with them down the road, Rick returns to the general store where the group last stopped. With the locals and law enforcement unwilling to believe the biker’s story, he enlists the help of two traveling salesmen who just happen to have rifles and flashlights on hand. Eventually it’s all-out war as Rick’s biker friends, who have returned to lend a hand, two traveling salesmen, three Indians, and Rick all chase down the leader of the Bigfoot band to try and save themselves and the kidnapped beauties! Even John Carradine couldn’t save this one. The Legend of Boggy Creek (1972) – Directed by Charles B. Pierce. Narrated by Vern Stierman. Starring: The Fine Folks of Fouke, Arkansas as themselves. In October 2014 on a return trip home from Texas, we decided to make a small detour to Fouke, Arkansas to realize a childhood dream, to see for ourselves where this movie was filmed. As with many of our little trips, I wish we’d had more time to explore. As it was we were able to stop at Monster Mart and get a few souvenirs and pictures, but little else. 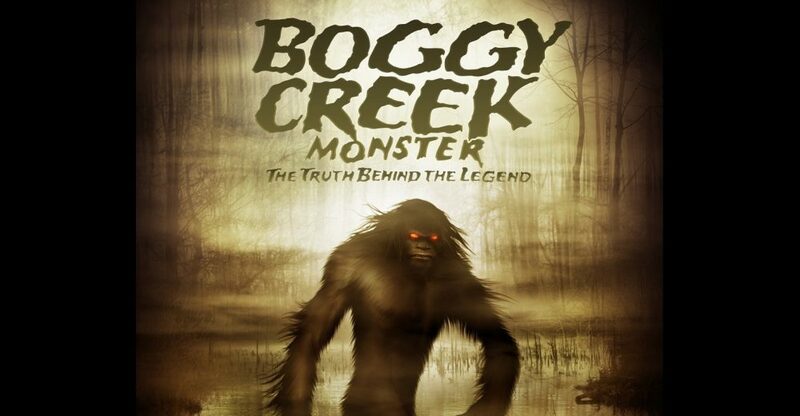 Told from the perspective of a young man growing up in the small town of Fouke, Arkansas, ‘The Legend of Boggy Creek’ always seems to stir up a lively conversation for people of a certain age who remember seeing it youngsters and being completely terrified by it. I am one of those people. The film is sort of a documentary, in that it stars mostly locals of the area telling and re-creating their lives during the time of the sightings. I do have to wonder just how much of this is based on fact and how much has been over-dramatized or completely fictionalized to make it more interesting and profitable. Either way, it was realistic and creepy enough for an entire generation of people to never, ever forget it and to seek it out again for at least another couple of viewings as adults. This was without a doubt, the first Bigfoot movie I ever saw and I’m pretty sure it’s probably why to this day, I hate looking out my windows at night for fear of seeing someone, or something, standing out there looking back at me. Additional movies, Return to Boggy Creek (1977), Boggy Creek 2: The Legend Continues (1985) and Bigfoot: Boggy Creek (2010) have all tried to capitalize on the story, but none were ever able to beat the popularity of the original. I am truly hoping the newest film mentioned earlier won’t disappoint. Documentaries on Bigfoot (and a myriad of other cryptids) seem to have run rampant back in the good old 70s. In this case, the first fifteen minutes are devoted to the Loch Ness monster, before moving on to Bigfoot. Full of historic still photos, early captures on audio and video along with dramatized eyewitness accounts as well as statements given by the real witnesses, we are also told about other man-apes found throughout the world, Bigfoot as known by his many names worldwide, Yeti, Sasquatch, the Abominable Snowman, and Skunk Ape. All in all, a seriously done documentary on what we knew and what was going on in the world of Bigfoot research in 1975. Though it’s a bit outdated, it’s still an interesting and informative watch. I saw this movie for the first time when it came out in theatres. My grandmother had wanted to treat me to a movie and being the odd child I was, this was my pick. She wasn’t so thrilled with my choice, but eleven-year-old me thought it was totally awesome at the time! It left me scared for many years. As an adult viewing it again, okay, maybe not quite so much, but it’s still a fun watch! Seven men head out on horseback for a three-month-long expedition into the wilds of the American Northwest in search of Sasquatch. Among them we have the obligatory Mountain Man, a Native American guide, and the camp cook who also happens to be a crack shot with a rifle and, along with some pesky raccoons and a badger, provides us with comic relief along the way. In between the long stretches of very Disney-esque scenes that felt more like a nature show than a movie about tracking Bigfoot, we are told some frightening tales in the form of flashbacks about previous encounters with the infamous creature in the area. Our intrepid group doesn’t reach their destination, the heart of Sasquatch country, until the final fifteen-twenty minutes of the movie, but boy do they get what they’ve been asking for in those final minutes. Initially I was scared, very, very scared at what this movie might contain, being as it was brought to us by those same people who produced Poultrygeist: Night of the Chicken Dead. But, I took a deep breath and braced myself for whatever I was about to commit myself to. This time around we’re hunting Bigfoot in the American ‘North Country’, in this case that’s Wisconsin, where Bigfoot apparently prefers to wear white. Or maybe they’re like certain rabbits who change the color of their fur to suit the seasons. Two trappers make the catch of the century when they snare a baby Bigfoot. Mama Bigfoot doesn’t take too kindly to this, leaving one trapper dead and the other seriously mauled. 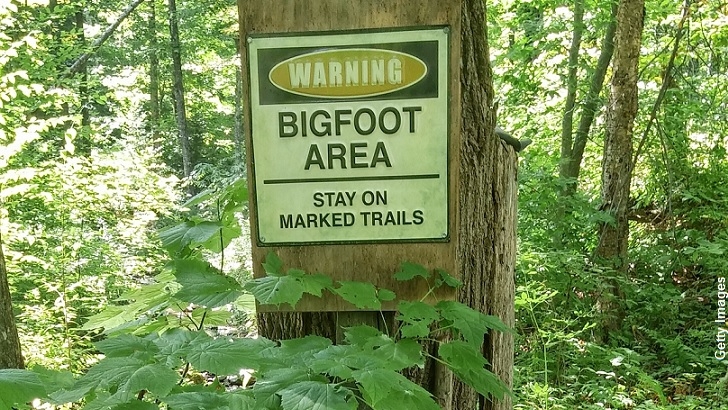 Word quickly spreads and soon others are out hunting down these elusive beasts and, as we all know, no good ever comes of a greedy business man who wants to cash in on capturing Bigfoot, some angry, gun-toting hunters, law enforcement, a vengeful Bigfoot Mama, and a nearby ski resort. I was surprised at how good this movie actually turned out to be. I’m not saying it was good. I’m saying it wasn’t absolutely horrible. The acting was pretty good and the plot was interesting enough to keep me watching to the bitter end. And, they very skillfully included a couple of kids in one of the side plots. This would be a good one to watch while up in your winter lodge on a dark and snowy night. And there you have it, my lead up to viewing the newest film Boggy Creek Monster: The Truth Behind The Legend which, hopefully will be happening this weekend. Maybe even tonight! To learn more about this one, check out an interview with one of its creators, Lyle Blackburn over at the Monster Men Podcast on YouTube Episode #114 along with this trailer Boggy Creek Monster Trailer. Back in 2014 we had the chance to pass through a small portion of the Pine Barrens of Southern New Jersey, the setting for horror writer Hunter Shea’s latest cryptid masterpiece, The Jersey Devil. Having had an interest in these sorts of creatures my whole life, I’ve known the legend of this particular being for many a moon. We passed through in the middle of the day so our chances of seeing this sinister fellow were slim to none. If Hunter’s portrayal of the Devil is even half-fiction, I’m deliriously happy that it and our paths never crossed, not even for a second. In short, the Legend of the Jersey Devil dates back to a dark and stormy night in 1735 when Mother Leeds gave birth to her 13th child. The midwives that had come to her aid swore she’d given birth to a demon. The Jersey Devil stands upright on two goat-like legs with cloven hooves. Its upper body resembles a dragon or snake with short arms ending in razor sharp claws while a pair of massive bat-like wings give it flight. The head of the Jersey Devil is said to look like a horse or large goat and its eyes glow a fiery red in the dark. The native Lenape People called the area Popuessing which means, “place of the dragon”. Later the Dutch would dub it Drake Kill or Dragon Channel. According to Hunter Shea, one too many thrill seekers decide to explore the Pine Barrens at a crucial time in the Devil’s life and the Willet Family, who have a long-kept family secret in regards to the Devil, want to be at ground zero, locked, and loaded when this bad boy shows up again. They watch the news reports, they read the articles in the papers, and take them all very, very seriously. One person, one couple, one group of foolish campers after another start to go missing and the body count is rising fast as they and cryptid hunter, Norm Cranston, enter the Barrens ready for the battle of a lifetime. What is going on? After years of nothing more than a few random sighting, the Devil’s MO is getting a little sloppy. He’s being spotted a lot and he’s not doing much to hide the evidence of his kills. 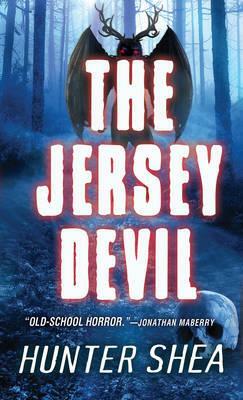 The Jersey Devil is a thrill ride of head-ripping fun. Dismembered limbs are flying and heads are rolling, literally. Blood and gore abound and nowhere is safe. And all this is even before the hunters meet one of the decedents of Mother Leeds who is reluctant to help them despite, or maybe because of, the recent uprising of violent activity. Planning a trip to New Jersey? Tempted to take a stroll through the legendary Pine Barrens? Read Hunter’s rendering of The Jersey Devil before you go and you may just change your mind real quick like. If not, well, don’t say you haven’t been warned. I give it 5 Ravens out of 5. Because apparently sharks, jellyfish, sting rays, electric eels, fire corral, lion fish, sea snakes, stone fish, octopus, and squid are just not enough to keep some people out of the water, author Hunter Shea has come up with yet another nasty creature of the briny deep. His creation, the Chimaera fish (aka Ghost Shark), isn’t entirely fictional but let’s hope to Poseidon these things never actually become a hundred percent real. Hunter specializes in monsters and cryptids. In “Swamp Monster Massacre” he takes on the legendary Big Foot\Skunk Ape. 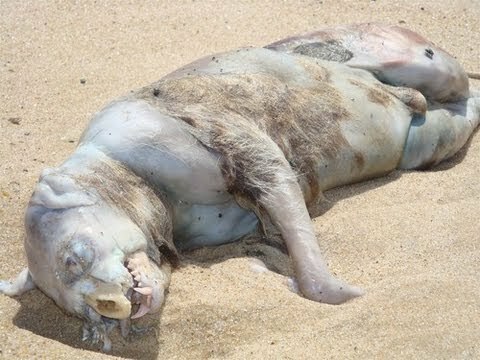 In “The Montauk Monster” we get to meet his version of well, the Montauk Monster, a pseudo-cryptid that first washed up on the shores of Montauk, NY back in 2008. Ghosts become deadly in Island of the Forbidden and zombies of all shapes and sizes populate the streets of Yonkers, and maybe even the world, in Tortures of the Damned. For “They Rise” Hunter Shea takes us deep sea fishing off the coast of Florida. It seemed like a good idea at the time, but things go bad fast when the fish at the end of the line ends up eating, instead of begin eaten by, the fishermen. What appears to be an isolated incident soon turns into an aquatic nightmare as it’s discovered these apparently extinct prehistoric fish have grown to gargantuan proportions with appetites to match. And there’s not just a few, but thousands of them! Human flesh rates high on their menu to the point of ramming and capsizing boats and jumping on decks to get to whoever is foolish enough to stand out there. 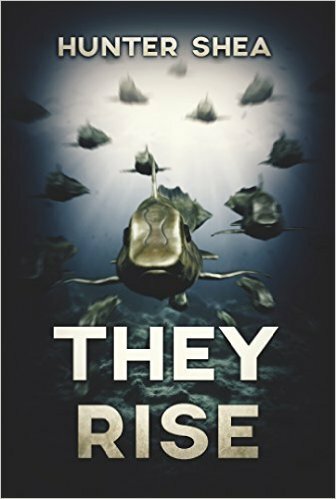 For a book of only 150 pages, “They Rise” packs in a lot of information, intrigue, blood and guts gore action, and suspense. Hunter Shea does not disappoint in the plot department at all and I enjoyed almost everything about this book. My only disappointment was central core character development. I didn’t feel like I got to know them as well as I would have liked and that left my sense of caring about what happened to them somewhat lacking. From reading several of his lengthier books, I know Hunter can do this quite well. “They Rise” would have benefited from a similar treatment. Despite that, an overall enjoyable and fast-paced read. I’d maybe not suggest it for anyone who plans on doing any deep sea diving or ocean fishing in those warm, southern seas this summer. I know I won’t be and despite this creature being primarily fictional, I’m still going to add the Chimaera fish to my fast-growing list of reasons not to swim in those sorts of places just to be safe. 3 out of 5 ravens. Road Gators, Vultures & Turkeys, Oh My! I got me one of those new-fangled ‘smart’ phones about a month back. My previous phone was pretty old, took lousy pictures, and internet was next to impossible. I balked at spending so much on a new phone considering how little I used the old one, but not wanting to fall too far behind in the world of technology and thinking having something better for an upcoming road trip might not be such a bad idea, I bit the bullet and took the plunge. Miraculously, I was able to transfer my minutes from my old phone to my new and input my contacts all by myself. Over the next two weeks, amongst other things, I learned how to answer my phone! Remember when all you had to do pick it up and say, “Hello?” I wanted to get to know this new piece of equipment as best I could before my teacher, my 23 year-old-son, was no longer available. Amazingly, my computer geek boyfriend’s phone is even more primitive than my old phone! He would be of no help whatsoever. They say there are two tests that will either make or break a relationship; a building/remodeling project or a road trip. A road trip with a smoker not allowed to smoke in the car and this unfamiliar method of phone GPS promised to be an adventure. I was assured his need to smoke would coincide with my need to use the ladies room. This was not quite how it happened. Our trip west was just over 1600 miles long one way. He’d traveled the roads twice on his own before and we’d made the journey together one-way a year and a half ago. His trips took two days. Our prior one-way took three, but we were pulling a U-Haul with a car stuffed to the gills. We allowed ourselves the time he’d made it in, two days. It seemed reasonable at the time. It also seemed a simple enough plan to take along lunch and drinks and snacks for the road. These were strategically placed, or so we thought, so that the passenger could easily turn around in their seat and get whatever beverage or edible was wanted. Long story short, someone had to stop to pee AND have a smoke a whole lot more that there was need of the ladies room. Course, being as my daddy always taught me never to pass up a chance to pee while on the road, I made use of these stops, too. There was no hope of visiting Boggy Creek in Fouke, Arkansas, let alone play at Dinosaur World in Kentucky, but we did see plenty of Road Gators. Clearly we have different priorities when it comes to travel! Next time, damn it! As for those snacks and drinks, ease of retrieval involved undoing ones seat belt, turning around and half crawling into the back seat while your pilot cruised along at about 70 miles-per-hour keeping an eye out for the numerous police cars. Of course, if a cop had been spotted chances are pretty high in our less than nubile conditions, we’d never had made it back into our proper forward-facing seated positions in time. Hot coffee in a foam cup or thermos top was a blast. It was an adventure alright. Admittedly it took longer than planned. We would like to blame a generous amounts of stop and go traffic due to construction, but I think it had more to do with too much coffee, sore bottoms, tired arms, head and neck aches, full bladders, nicotine fits, leg cramps, hunger and just plain “I’m tired and I’m cranky” moments. We rolled into the driveway of our final destination at about 1:15AM, a good three hours later than we’d hoped. Our return trip thinking may not have been as well thought out as we’d intended. It’ll be faster if we miss all that construction, right? What’s a couple extra hundred miles, right? We’ll be going faster, right? It’ll be fine. Even if we get in by midnight, that’s alright. Did I mention Jim had to be to work by 2pm the day after we planned on getting home? No? Well… yeah. That’s not quite how it worked out either. We got off track before we even left Texas! This is where the aforementioned new phone technology comes into play. It seemed a simple enough plan. Instead of going through construction riddled Waco and congested Dallas, we’ll just cut across and head towards Shreveport, Louisiana. Piece’o’cake. ‘Cept somehow we found ourselves heading towards Houston. Why does the car’s compass say we’re headed southeast? Without a paper map, we had to rely on my phone’s GPS which I had used maybe twice before and, of course, ‘Connection To GPS Has Been Lost’. Eventually, it kicked in well enough and long enough for me to figure out where we’d gone wrong and get us back on track, while Jim expertly avoided hitting a flock of five or six vultures dining on road kill armadillo. Past experience told him that it was in our best interest to not be driving around in the Deep South with a dead vulture pressed into the grill of the car. We zipped through Louisiana and Mississippi like nobody’s business, keeping an eye on the numerous road gators, making certain they weren’t flesh and blood gators. We even stopped at the Mississippi Welcome Center and did a touch of site-seeing. Alabama welcomed us and at 9:30 we started looking for motels. By 10:00 our exhausted bodies and brains were settled in. As we unloaded the car, and the loud drone of whatever big and bizarre nocturnal bugs and birds they have in the woods of Alabama buzzed around us, we wondered what State “Deliverance” is supposed to be set in and if we were anywhere near there. (Answer: The remote northern Georgia wilderness on the fictional Cahulawassee River and no.) Course… there’s still Big Foot or Skunk Ape or whatever they call him down there, to deal with! Our hopes high, we gobbled down hardboiled eggs, blueberry muffins, bananas, and coffee the next morning in the motel room and headed out, bright and early by 7am. Tennessee and Kentucky proved to be our friends. Yeah, we’ve made it to Virginia. I silently wished there was time to visit my cousin in Roanoke. And then, we saw the flashing lights. “Urgent Message When Flashing” the roadside sign warned and told us where to tune for details. We tuned in. We listened. It didn’t seem to pertain to us. We sallied forth, returning to whatever decent rock station would come in, settling on country as we had to. Several miles later, “Right lane closed ahead. Prepare to stop.” Traffic reports on the radio told us there were delays ahead. We slowed to the pace of a rolling parking lot. Dead still and a walking pace swapped places for the next fifteen to twenty miles, at least. It seemed like a hundred. Jim threatened to get out and walk alongside the car while I drove so he could have a ciggy. It probably wasn’t really such a bad idea. I’m sure we’d have stayed abreast of each other well enough. Thank God neither of us needed to use the restroom. Over the radio we heard something like this: “The right lane of Interstate 81 North in Botetourt County near mile marker 154 will remain closed until approximately 7 p.m. while crews continue clean up from a tractor-trailer accident. The tractor-trailer was hauling around 2,700 turkeys. Crews on scene are still removing turkeys from the area. Drivers are advised to keep watch for any other birds that may still be loose in the area.” What could we do but burst out laughing? I know, I know. It shouldn’t have been funny at all. Poor terrified turkeys and all, but all I could imagine were turkey running amok along the roadside like some sort of Warner Brother’s cartoon and an incident with my brother when he was just learning to read. It was a different road trip entirely. I was seven. My brother would have been about ten. We were headed to Florida and suddenly he said, “Well, where are they?” One of my parents asked, “Where are what?” He said, “The chickens.” Confused looks were exchanged. “What chickens?” “The chickens I keep seeing the signs for.” More confused looks took place. He was instructed to point out one of these signs if he saw another and sure enough in only a few more miles he announced triumphantly, “There’s one! See! Speeding chicken by road! So, where are the chickens?” My parents both burst out laughing. “No, honey, that says, ‘Speed Checked By Radar’. My brother was quite disappointed. We, too, were disappointed in some strange way. Not only did we not see any amok turkeys, speeding or otherwise, by the time we reached the accident site there was nothing but a dusting of white feathers scattered along the road while clean-up crew men picked up traffic cones and freed us to return to full highway speed once more. The Cracker Barrel in Bristol, Virginia fed us and the skies just outside of Winchester delighted us with a beautiful sunset. It was clear by now we were not going to make it home by midnight, not even close. GPS told us we still had five and a half hours to go. Stopping for the night seemed more sensible than getting ourselves killed. Sleep was short and fitful. I felt so bad for Jim, knowing he was not sleeping any better than I was and that he had to be into work that afternoon. I took first shift driving, hoping he’d be able to get in a couple more hours of sleep at least. I’m pretty sure we were both feeling the stress more than either of us let on. We just wanted to get home. By noon, we’d passed yet another test of our relationship. I realized along the way that different things about these trips and driving seemed to annoy us. That really worked to our advantage, because when one person was getting antsy and annoyed, the other was able to remain calm and interject some humor into the situation. We make a good team, me thinks. Now… about that building project. I’m Writing As Fast As I Can. Part 2 – The Murder! The Newest Barnesville Chronicle Cover Release!